Leather jackets, brylcreemed hair, side burns and motor bikes – these were the hallmarks of the 60s Rocker. 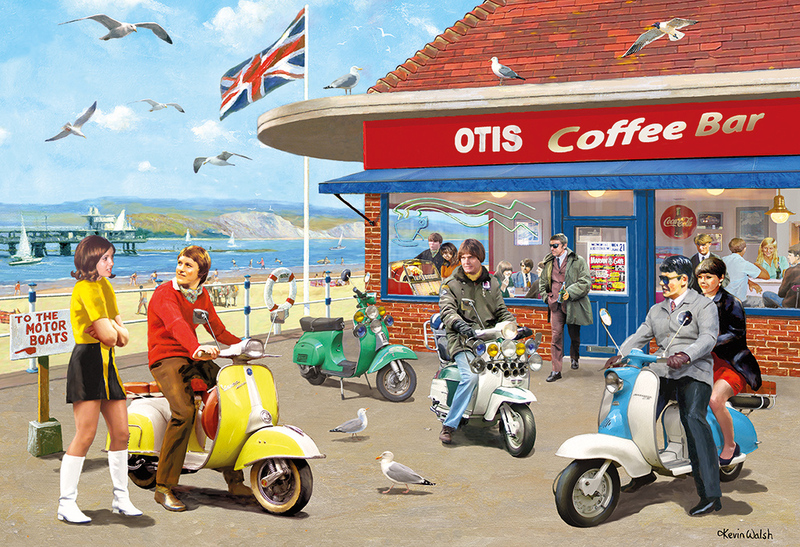 The Mods, on the other hand, liked fine cut trendy clothes, parka jackets, mop haircuts and rode Lambretta and Vespa motor scooters sometimes adorned with shiny lamps and mirrors. The competition between the two groups frequently boiled over and lead to running battles in town centres and beaches along the south coast of England. There are two 500 piece puzzles in this multi-box, both of which have been painted by renowned artist, Kevin Walsh. Kevin Walsh’s paintings are part of Gibsons nostalgia range and many of his original oil paintings can be seen at the Headrow Gallery in Leeds. Born in Castleford in the heart of former industrial West Riding of Yorkshire, from the same town as famous sculptor Henry Moore. During his degree, where he studied illustration at the Wakefield College of Art, Kevin became well known for his aircraft paintings and became a member of the Guild of Aviation Artists.